For further information contact info@thekosh.com. After sell out performances and rave reviews for their last two touring productions – The Storeroom and Café Chaos, The Kosh is producing The Divided Self a new show for rural touring. Mr. Parks and Ms.Williams meet alternate Friday evenings for a piano lesson. When Mr. Parks suggests an inspired alternative act for their debut public performance, Ms. Williams shows a startling ability for improvisation. 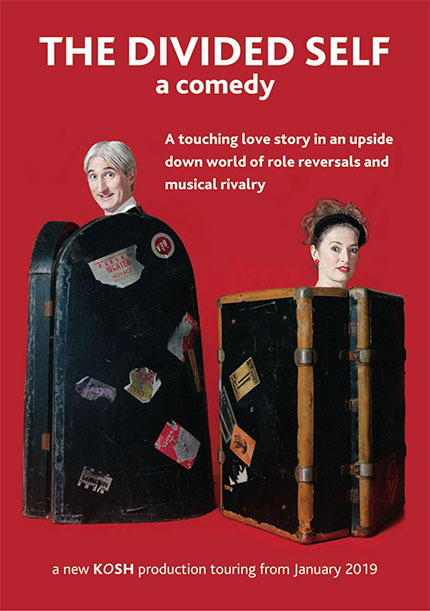 A brilliantly funny, farcical mixture of physical comedy, music, song and dance, in an upside down world of role reversals, rehearsals and musical rivalry. The production is technically self contained and requires minimal get in facilities. The Divided Self touring from January 2019 For bookings and further details contact info@thekosh.com.